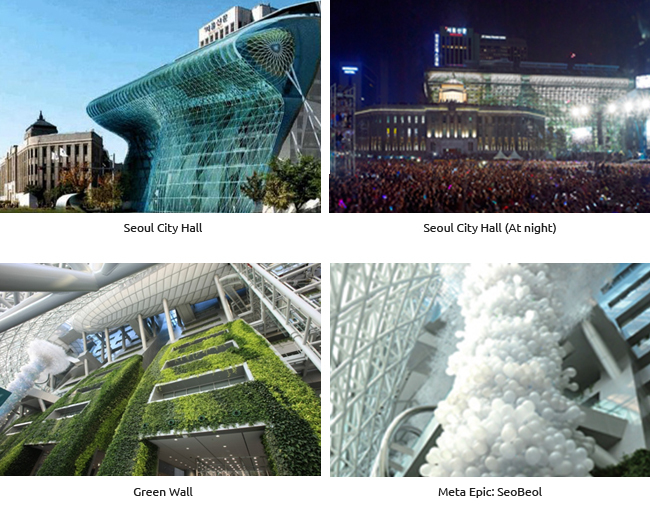 After four years and five months of construction, Seoul City Hall was reborn in October 2012. The new Seoul City Hall is an eco-friendly building with a unique exterior, the design of which is based on the eaves of traditional Korean houses. The total floor area of the city hall buildings is 90,743m², including the old city hall building, which is now the Seoul Metropolitan Library. Government offices account for 62 percent of the area, and public spaces for citizens make up 38 percent. The building is highly efficient, as it is built with a double skin façade system. About 28.3 percent of the energy used in the building comes from eco-friendly energy sources, including photovoltaic, solar thermal and geothermal. The Green Wall is the most popular attraction at the Seoul City Hall building. Spanning an area of 1516m², the size of a soccer field, this vertical garden climbs up the inner wall, all the way from the first to the seventh floor. It was named in the Guinness World Records as the largest vertical garden in the world. Over 70,000 plants of 14 different species were planted in the garden over an eight-month period. They help to eliminate contaminants and fine dust and regulate the temperature and humidity. When visitors take the elevator or escalator from the Haneul Plaza on the ninth floor down to the first floor, where the double skin façade can be clearly seen, it feels like being inside a spaceship. “Meta Epic: SeoBeol” is a symbolic artwork that expresses the long history of Seoul, which has been the capital city for 2000 years, by incorporating light, pathway, and “tornado” characteristics. As parts of the “Meta Epic: SeoBeol” artwork, the “Path of Myth” symbolizes the dynamic myth of Seoul, the “Light of Hope” symbolizes the hope of Seoul citizens, and the “Tornado of Life” symbolizes how the City of Seoul communicates with its citizens.